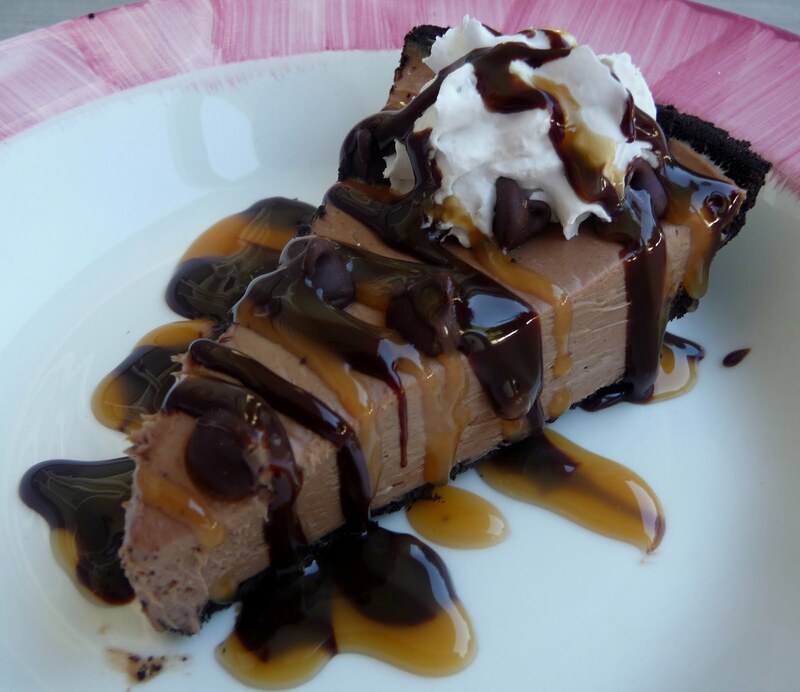 My mom was up visiting on Sunday and told me about this easy chocolate cheesecake -that get this- only has 4 ingredients! She said she loved it and that I had to try it. Well today I made it and it was really good and EXTREMELY EASY! Melt chocolate chips with 1 Tbsp. oil in microwave for 1-1/2 minutes until melted, stirring every 30 seconds. Add melted chocolate to softened cream cheese and sweetened condensed milk and beat until well blended. Pour equally into two Oreo pie crusts and refrigerate until set. Garnish with chocolate chips, whipped cream, chocolate syrup, and caramel syrup. Is it really that easy?? I am SO making this! Thanks for sharing! So excited to try this! Tomorrow is my husband's birthday and he asked for either chocolate pie or cheesecake! How perfect! Gorgeous cheesecake! Can I have a bite? Quick, simple, easy, + chocolatey, what not to love! Thank for sharing. Thanks for sharing! :] I'm def. trying this out! Wow! Can't believe how easy that sounds to make. OMG! That looks delicious!!!! I will definitely be making this!! WOW!, must try this, thanks! thanks for linking to Take-A-Look Tuesday - I just featured you on my FB page! oh.my.gosh. i love chocolate and cheesecake! This looks yum, yum, YUMMY!!! will defo be trying to make this soon!! I love this!!! I will definitely have to make this! Mmmm....featuring this next week! :) What an easy recipe! When I see sweetened condensed milk in the list of ingredients, I know I'm in for a treat. This cheesecake looks delicious! Thanks for sharing on Sweet Indulgences Sunday. Oooh, this looks awesome! Thanks for sharing! Beautiful slice! You're right, very easy recipe. Thanks for sharing it. Oh...YUMMY!! You dressed it so pretty too!! That looks amazing, my mouth is watering. This sounds really easy and looks so darn delicious, I will have to try this! You could eat that picture, haha! Seriously, chocolate and cheesecake delicious on their own. The two combined look like a mouth-watering tag team. What size is the condensed milk can? I made this today and it went over really well. Very good and very rich. One slice was definitely enough. I made this at Christmas for my family, and they all loved it! Thanks so much for sharing. And by the way, I am a huge fan of your site. My pinterest board is packed full of your recipes. They all look so good! chocolate cheese cake uses which chocolate chips. is it semi chocolate chip? what kind of oil do i mix into the chocolate chips when microwaving them?